thanks for the reply, I sent you an email. 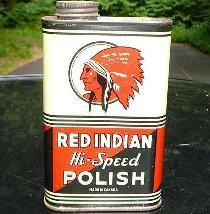 Anyoen out there with red indian stuff, I will pay cash or let me know if there is something you are looking for. Well, I have 6 Red Indian signs, 1 oil rack and 1 globe,,,, oil bottles, qts. & pts., so what is it that your looking for ??? Wes, I oticed all your red indian stuff was removed from your site. I saw the signs and oil rack on there before. Didn't know that you have a globe or any tins. Also some very unique Indian refining, mccoll frontenac, red indian smalls. Black T would you send me an email with your stuff you are willing to part with,, pics and prices ?